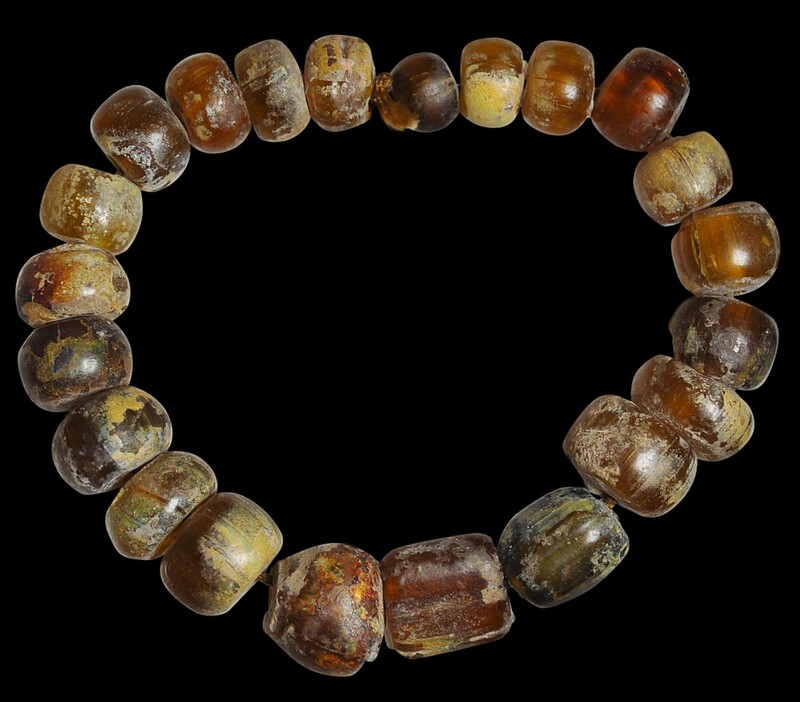 This strand of 22 glass beads (21 graduated spherical beads and one central rectangular, pillow-shaped bead) is a mixture of ancient glass beads that have gold foil folded into the glass giving striations, and/or are encased in gold foil (but with only remnants remaining). There are enough beads to make a loose-fitting bracelet that will go all the way around, or the beads could be incorporated into a larger necklace. The beads are very rare. It is believed that the technique of folding gold into molten glass originated in ancient Egypt and that other centres using the technique arose elsewhere such as in Rhodes, Nubia, Armenia, and possibly India. The prevalence of early bead trade also confuses the issue – where a certain bead is found need not imply at all that its place of manufacture was there or even close. Beads such as these have been found in Java as well. For example, Geoffrey-Schneiter & Crick (2016, p. 142) illustrate a related, larger strand attributed to central Java’s Classical Period. 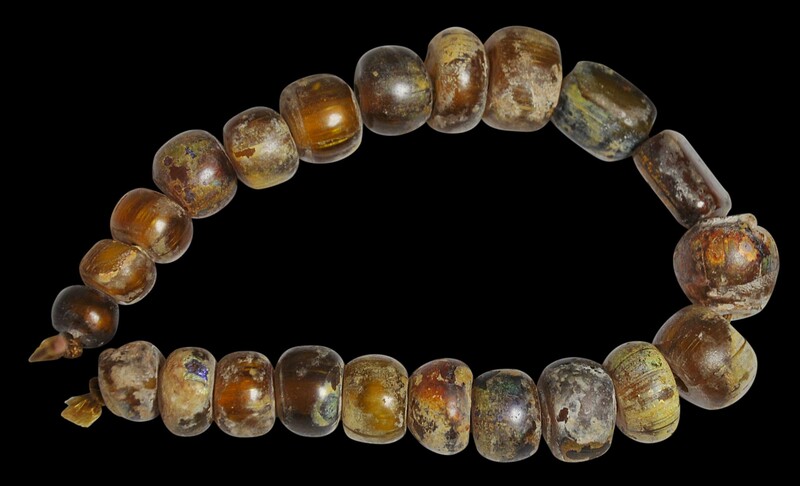 The beads here have a wonderful warm caramel patina. They are clearly ancient and are in relatively good condition. One has an old, significant chip; the others are largely free of losses. Spaer, M., ‘Gold-glass beads: A review of the evidence’, Beads: Journal of the Society of Bead Researchers, Volume 5, 1993.